New Orleans, affectionately known as “The Big Easy,”is the largest city in the state of Louisiana. New Orleans is situated in the southeastern part of the state, on the banks of the great Mississippi River. Much of New Orleans lies at or below sea level. New Orleans is treasured for its diverse culture heritage. Thousands of tourists from around the world visit New Orleans each year to take part in the famous Mardi Gras festival. 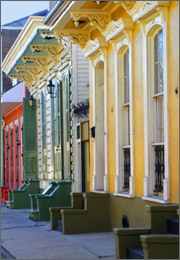 New Orleans also offers year-round attractions, including the historical French Quarter, Bourbon Street nightlife scene, and Magazine Street shopping district. Given all its attractions, it is no surprise that New Orleans’ economy is heavily based on the tourism industry. New Orleans is also a major port city. In addition, Louisiana is home to some major corporations, including two Fortune 500 companies, Entergy Corporation and Freeport-McMoRan. Recently, the City of New Orleans and the Second Amendment Foundation (SAF) came to an agreement over a federal lawsuit filed in 2005 by SAF. SAF and its supporters, including the NRA, claimed that the City confiscated firearms in the aftermath of Katrina without legal authority, in violation of the U.S. Constitution’s Second Amendment, which protects the right to own and possess firearms. The settlement terms require the City to attempt to return all firearms that police and National Guardsmen seized following Katrina. Over 4,000 lawyers reside in New Orleans, and many of them often work alongside prominent Baton Rouge lawyers. LegalMatch can connect you with a New Orleans lawyer at no charge. LegalMatch screens its lawyers, so you can be assured that your New Orleans lawyer is bar certified and knows how to handle your legal needs. Whether you need a criminal defense lawyer, a bankruptcy lawyer, or a family law lawyer, LegalMatch can help. Simply complete an online intake form, and let a LegalMatch agent find the perfect lawyer for you. Additionally, if you would like to conduct some background research on your legal issue, feel free to read through the LegalMatch Library, post a question on LegalMatch’s Forum, or explore the links below.